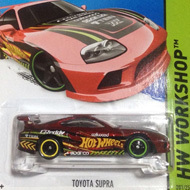 184/250 is part of the HW Race series and the 2015 Super Treasure Hunt set. 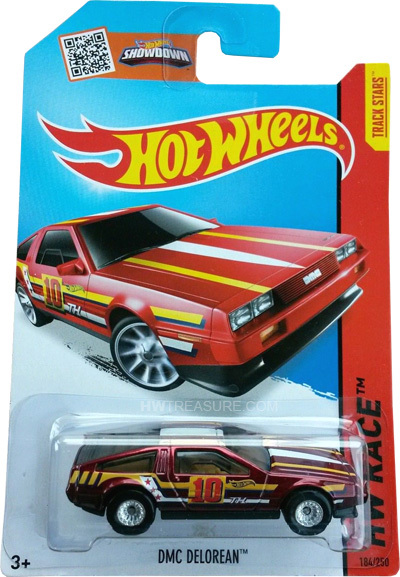 The Spectraflame red car has a top with two yellow stripes and a white center stripe. 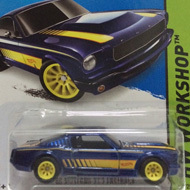 Each side has a yellow stripe with the Hot Wheels logo and “10” in red. There is also a white strip with “TH” and red stars. It has tinted windows, a tan interior, Real Rider Turbine wheels, and a black plastic Malaysia base. The DeLorean made its debut in the 2010 New Models series. It is based upon the DeLorean DMC-12 which was produced from 1981 to 1983. The sports car is known for its stainless steel body and gull-wing doors. The car gained notoriety and continues to be highly recognizable from its use as the time machine in the Back to the Future movies.